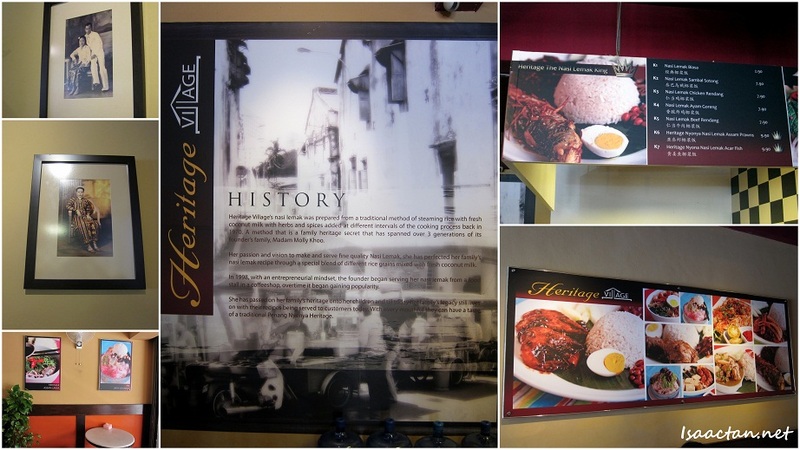 Heritage Village is this cafe serving nyonya food located in the vicinity of Aman Suria, Petaling Jaya. My late grandmother was a nyonya herself, and I must tell you, her homecooked food were excellent comparable to none, hence I arrived at this restaurant with very high expectations. I wasn't disappointed at all. It was a rainy Sunday afternoon, when I arrived with a bunch of food bloggers under part of the Selangorlicious Foodster Trip "program". Heritage Village is a certified halal restaurant, serving some really good Penang nyonya cuisine, just like how my mum and late grandmother cooks it. In fact it was so similar in taste for some of the dishes, I actually called the owner to the side to tell him how good it was. 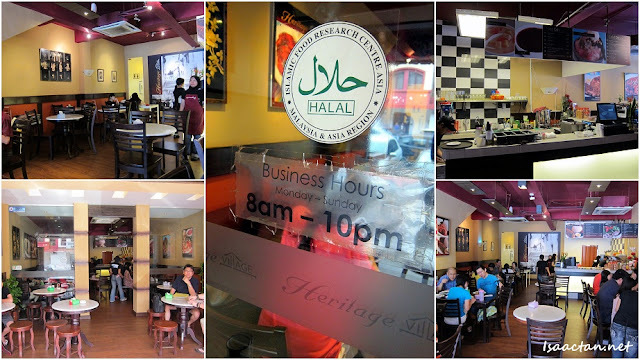 The ambience was good, not unlike many of the cafes and restaurants around PJ area. I took the chance to capture some photos of the decor. It wasn't long before the dishes were served. I'm from Penang myself, and being here tasting these food brings me back to my hometown. It's as if I'm having my Char Kuey Teow, Chendol, and "Hokkien Mee" in Penang itself! Do check out below on some of the photos I managed to capture that afternoon. Crispy on the outside, meaty on the inside, I just had to take this shot. I do have to commend on the Har Mee and Assam Laksa, if you haven't tried Penang laksa yet, try it here. The sourness is just right, coupled with huge chunks of fish inside the soup, tastes just like home I tell you. Next up on the menu was the set meals that Heritage Village offered for its customers which consists of 1 Nasi Lemak with a choice of an optional dish. Below would be a photo of the Nasi Lemak, and the optional dishes available. Good stuff I tell you. All the above optional dishes came with either rice or Nasi Lemaks, were really reasonably priced and delicious to boot. I recommend taking the Ayam Goreng Berempah, Assam Udang, and the Chicken Rendang. Do try the Acar Fish, but the sourish taste might be a bit too strong for some folks. Next up are the other side dishes available to order at Heritage Village. It's supposed to be rolled up this way, and eaten with some sambal chili, delicious! Now this "Jiu Hu Char" dish got me really excited as this was one dish my mother never misses out during our chinese new year reunion dinner as well as the dish to be had on the auspicious day itself. Guess what, it tasted exactly like how my mother cooks it! Of course, a good Penang Nyonya meal wouldn't be complete without some sweet desserts, and what better dessert to have than Penang's evergreen Durian Cendol and ABC. I loved the Durian Cendol, there was even a piece of D24 Durian in the middle of the bowl. Overall it was a really hearty meal, and I really have to refrain myself from repeating the fact that all the dishes served in Heritage Village tasted exactly like what we would taste if we ordered it in Penang. Good food indeed, and to end it, a group photograph of the food bloggers present that afternoon together with Heritage Village owners. Will I come back here again? Definately, if not just for the the Char Kuew Teow, "Jiu Hu Char" and Durian Cendol. I wish to try Pon Teh Chicken! I had once before in malacca and it was freaking good. Oh, yes, the olden Nyonya ladies generally have a reputation of being good cooks! My favourite is the har mee and asam laksa. Yum-yum. P/S: You are actually photogenic leh. You look nicer in the photos compared to when we met in Midvalley GSC for Tintin. Very sedap looking.. the prawns 9.90 only? so cheap? Love the desserts displayed..
Ooo as good as Penang's version ah... must try then! Eh! How come I didnt know you are from Penang too?? I was from SXI. You leh? Hungry ar!! :P jom lets makan again!